FREE SHIPPING. All orders that are to be shipped within the U.S. pay no shipping fees. Outside the U.S., the shipping fee will be $20 for up to three copies. For an additional $3, you will receive the book autographed by the author. 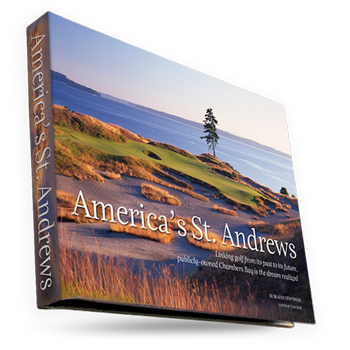 "America's St. Andrews" is a hardbound coffee table book with a dust jacket, 12" wide by 9" high, 160 pages, 182 photos and images. If you experience problems using PayPal, please call us at 206-890-5339. Or, you can contact PayPal directly at 888-221-1166. Be forever linked with the 2015 U.S. Open. Be forever linked with history. Discounted rates for bulk orders. A great gift for clients, customers, employees and friends. To place your bulk order, please call 206-890-5339 or email us. Wholesalers and retailers: Please call 206-890-5339 or email us for pricing.